The Dodgers are going to the World Series for the first time in nearly 30 years and we already know who will be on the mound for Game 1 in Los Angeles. 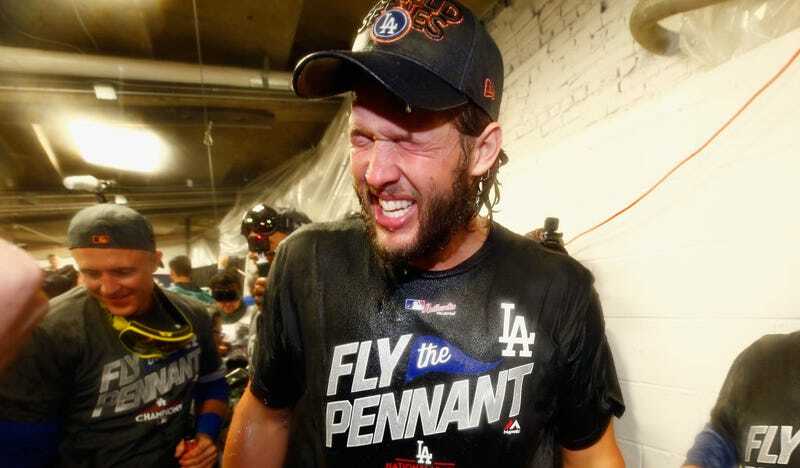 It will be the face of the franchise, Clayton Kershaw. It couldn’t be anyone else. Thursday night, in the fifth and final game of the NLCS, Kershaw went six innings, giving up only three hits and one run. He worked at an efficient pace, needing only 89 pitches to get through his portion of the night. Kershaw’s team is stacked with enough weird and wacky talent—Chris Taylor as NLCS co-MVP? Kiké Hernandez with three home runs?—that the postseason focus has for, the first time in his career, been taken off Kershaw this postseason. But even on a team with Justin Turner and Yasiel Puig and, uh, Chris Taylor, this is decidedly Clayton Kershaw’s moment. Kershaw has been the one great hope of this team through a bankruptcy, three managers, and now seven attempts to reach the World Series. He is the best pitcher on the planet by broad consensus, and this is the stage he has earned. Ostensibly, this is Kershaw’s chance to buck his reputation as a postseason hack, which is both overblown and fairly circumstantial. He’s been the victim of bad managing, of a missed understanding that pitchers tend to get beat up a little more the third time through the lineup, of relievers—Pedro Baez—allowing inherited runners to score. He’s the man, so he has been the man to blame. What Kershaw has not had in his twenty-one postseason appearances is one of those games where he truly Does It All a la Madison Bumgarner, or Justin Verlander’s complete game masterpiece in the ALCS last week. Kershaw has had four postseason games with more than 10 strikeouts, but he has never gone deeper than the seventh inning. He hasn’t enjoyed the glory of other, less-great postseason pitchers. Maybe he will finally have one of those games next week, or maybe he won’t. Dave Roberts has been pretty conservative with his starters, if only because his bullpen, which has put up an astonishing 0.94 ERA this postseason, is right there to eat those late-game innings. But what if we get The Clayton Kershaw Game? What if he is so great that Roberts can’t risk taking him out? What if Kershaw has one of his familiarly great games in a World Series that is pretty much a lock to get incredible ratings already? Are you not giddy at the prospect? Do you not hum with anticipation of Kershaw finally getting his due glory, whether you’re a Dodgers fan or not? What if? What if? What if?